A K Bhatnagar | I.K International Publishing House Pvt. Ltd.
served as a Professor and Head in the Department of Botany, University of Delhi. He was briefly on deputation as a Senior Environmental Officer and Principal Scientific Officer in Conservation and Survey Division of the Ministry of Environment and Forests, New Delhi. At the University of Delhi, he taught reproductive biology, plant diversity and environmental biology for over 30 years. 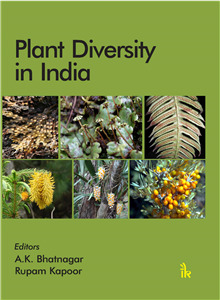 He has co-edited four books (one on Plant Diversity and Conservation), co-authored one book "Ethnobotany: Himalayan Region", and has published about 70 research papers and an equal number of semi-technical and popular articles on plants and environment. He recently chairs a research committee and is a member of Genetic Engineering Appraisal Committee (GEAC) and Ecosystem Research Committee (ERC) on mining (non-coal) in Ministry of Environment, Forests and Climate Change (MoEFCC).